Thank you for your interest for our 2 lock-out Ocean-Bay front Bayshore Studios. Our lock-out unit is in the most sought after area in Tampa on Bayshore Boulevard overlooking the Ocean of Tampa Bay in the heart of Hyde Park in SOHO and near Florida Aquarium & Busch Gardens. Our lock-out unit is in the most sought after area in Tampa on Bayshore Boulevard overlooking the Ocean of Tampa Bay in the heart of Hyde Park in SOHO. Being in the heart of SOHO-Hyde Park, with less than 1 mile walking distance to downtown, University of Tampa and Tampa General Hospital this is the perfect waterfront location in Tampa. Bayshore is extremely SAFE with 24 HOUR SECURITY, enjoy covered parking just outside unit and a laundry room just outside unit as well. Deluxe Unit comes fully furnished and consists of: 2 adjoining lock-out Studios each with 1 bath where one has a patio, overlooking ocean-bay front, 20 yards to the pool & Jacuzzi Approximately total 700 sf. See Floor plan and Interior below. 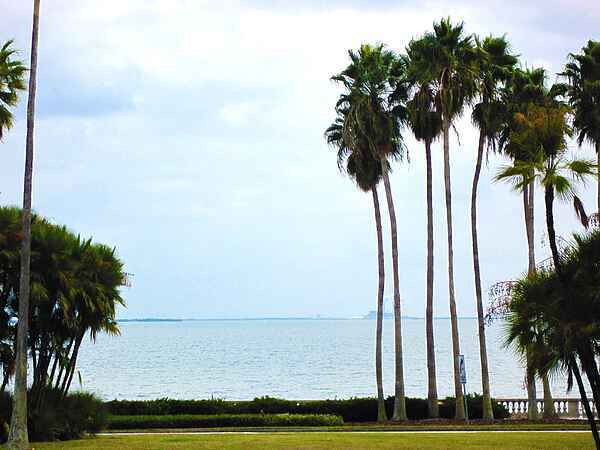 Ocean-Bayfront 2 bedrooms overlooking Tampa Bay, next to world famous Bern’s Steak house, in heart of Hyde Park & SOHO on Tampa's exclusive Bayshore Blvd, Florida's longest waterfront boardwalk. Walk to all famous lounges, restaurants and night clubs. One of a kind - overlooking exclusive Bayshore Blvd's Boardwalk and Tampa Bay’s Oceanfront! 2 bedrooms are approximately 400sf sleeping up to 3 persons in each 2 bedroom and has European tile throughout and furnished with deluxe leather sofas. 2 bedrooms are located on the bottom floor next door to Tampa's #1 rated European Restaurant with a Spanish flair called Ceviche and with easy access to your Bayshore stroll or popular roller-blade run. Within one block you can also walk to Tampa´s finest gourmet restaurants: Bella´s Italian Restaurant, Tampa’s nr 1 top rated Restaurant Ceviche with live music 4 days a week and famous Bern´s Steak House with the world's largest wine selection with 9,000 different wines, totaling half a million wine bottles. One mile away you find Old Hyde Park Village with a European style exclusive outdoor mall.